With so many text editors in the App Store, developers try to differentiate their products by adding unique features, such as Markdown or TextExpander support, PDF exporting, and custom keyboard layouts. I’ve tried an assortment of iOS text editors over the years, and while all of them have some useful and unique features, none of them provide all the features I could want. Editorial 1.0 seeks to solve this problem by allowing users to build missing features themselves. Before releasing Editorial, Ole Zorn of omz:software developed Pythonista, a Python interpreter that’s designed to build and run Python apps on iOS. Surprisingly powerful, Pythonista can help you build scripts that, for example, control other apps in order to automate repetitive work. Editorial works with Dropbox to provide a versioning system so that you can track changes. 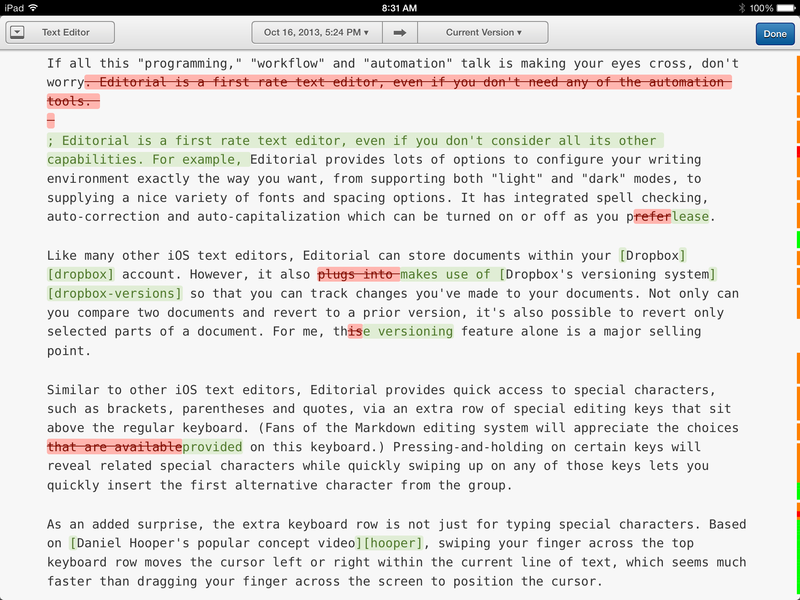 If all this “programming,” “workflow,” and “automation” talk is making your eyes cross, don’t worry; Editorial is a well-designed text editor, even if you don’t use all its automation capabilities. Editorial provides lots of options to configure your writing environment exactly the way you want, from supporting both “light” and “dark” modes to supplying a nice variety of fonts and spacing options. It has an integrated spelling checker, plus auto-correction and auto-capitalization functions that you can turn on or off as you please. 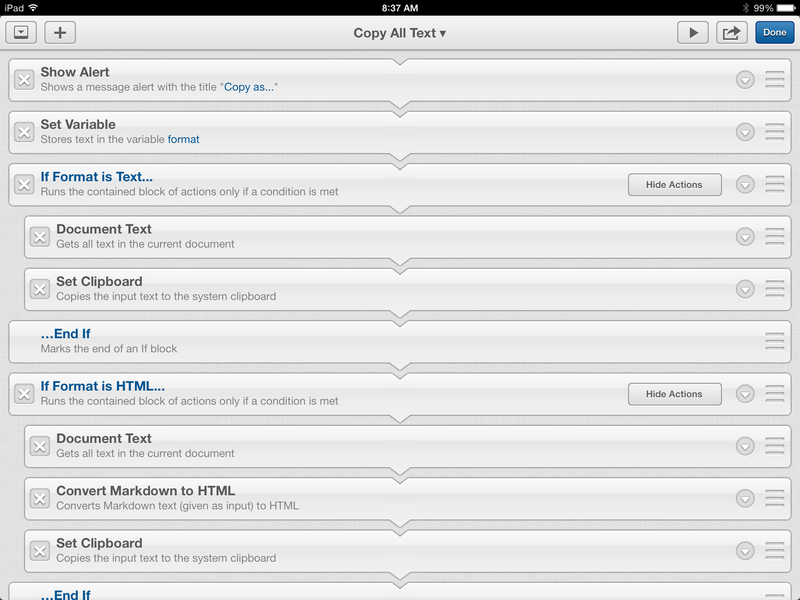 Like many other iOS text editors, Editorial can store documents within your Dropbox account. However, it also makes use of Dropbox’s versioning system so that you can track changes you’ve made to your documents. Not only can you compare two documents and revert to a prior version, but you can also revert selected parts of a document. The versioning feature alone is a major selling point. The app’s real power lies in its support for building “workflows,” or mini programs that you can assemble Lego-style using a wide variety of canned actions. This is a genius concept; rather than trying to include every conceivable text-handling feature into Editorial, the developer has provided a relatively easy way for users to build those features themselves. Several workflows come with the app. For example, the Copy All workflow grabs all the text in the document (without your having to highlight it) and copies it to the clipboard, either as text or HTML. The Paste As workflow takes the clipboard contents and permits you to paste it as paragraph text, a code block, or a block quote. You can use these workflows as they stand, but they’re also useful for learning how to build your own. You access workflows from the wrench icon; but as with snippets, you can also add the ones you use most often to the bookmark bar. Editorial uses 'workflows' that you can assemble to make the app more robust. Although it’s impossible to describe workflows fully in this short space, many references can help you get started. The developer’s website is a great resource for documentation, discussions, and downloadable workflows. But perhaps the most comprehensive look at the app is Federico Viticci’s extensive review of Editorial, which is also available as an expanded iBook version in the iBookstore. 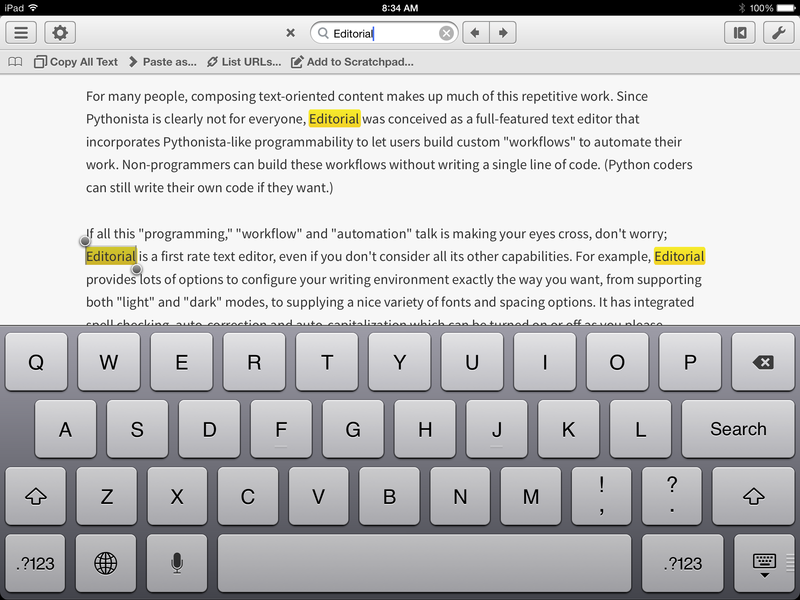 Similar to other iOS text editors, Editorial provides quick access to special characters, such as brackets, parentheses, and quotes, via an extra row of editing keys that sit above the regular keyboard. (Fans of Markdown will appreciate the choices provided on this keyboard.) Pressing and holding certain keys reveals related special characters, while rapidly swiping up on any of those keys lets you quickly insert the first alternative character from the group. An added surprise: The extra keyboard row is not just for typing special characters. As first demonstrated in Daniel Hooper’s popular concept video, swiping your finger across the top keyboard row moves the cursor left or right within the current line of text, which is much faster than the standard method of dragging your finger across the screen. 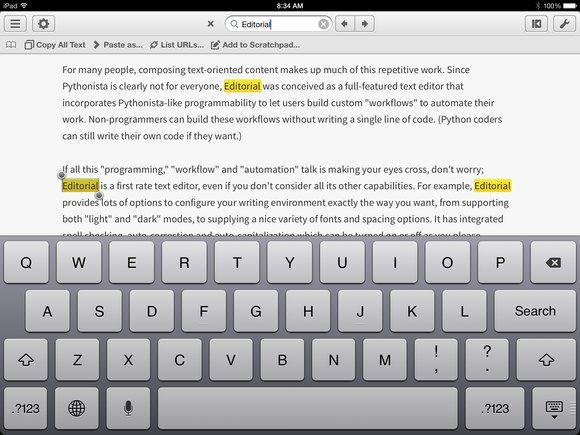 Editorial adds a row of keys to the keyboard for easy access to special characters. With Bluetooth keyboards, this row of keys sits at the bottom of the screen whenever you’re in editing mode. I’ve noticed that the top edge of the special keyboard flickers occasionally, which I’m sure is a small bug that will be fixed in a future release. Markdown fans will also like the optional inline preview mode, as well as the full-blown HTML preview screen that you can access by swiping in from the right edge of the screen. In addition, this preview pane gives access to the Help documentation, a Python console (which developers will love), and an integrated Web browser. Editorial supports TextExpander, so owners of that utility can expand their snippets directly within the app. (TextExpander is supported only on iOS 6. The upcoming Editorial 1.1 release will reenable TextExpander support but will require iOS 7.) Editorial provides its own snippet-handling system, as well; a few common Markdown-oriented snippets are included, and the built-in snippet editor lets you construct your own text abbreviations. You can access your snippets by typing their abbreviations, selecting them from the special editing keyboard, or adding them to the bookmark bar at the top of the screen. Editorial has an excellent search implementation. All text editors worth their salt should offer a way to search within your documents, and Editorial’s search feature is a joy to use. After you display the search toolbar and enter the text to be found, Editorial highlights each occurrence of the word(s) in yellow and selects the first instance. 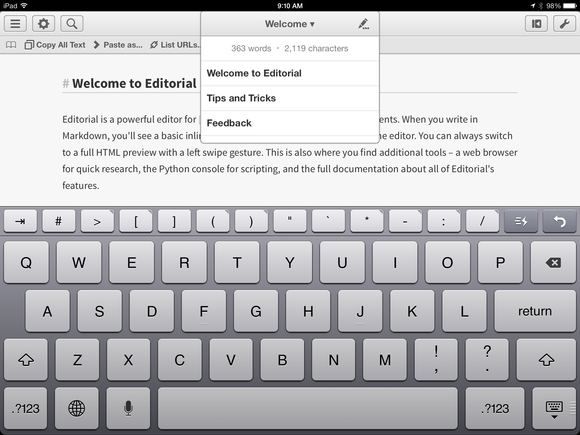 As you tap the left or right search arrow button, Editorial selects the previous or next instance. When you edit the selected instance, the remaining instances stay highlighted, and you can continue moving back and forth among those highlighted words until you dismiss the Search toolbar. On desktop computers, we’ve become accustomed to applications that interoperate and—with the assistance of software such as AppleScript, Hazel, and Keyboard Maestro—let us automate repetitive tasks. iOS, however, has thrown a monkey wrench into this model by keeping apps isolated from one another. Editorial, along with its sibling Pythonista and some others, heralds a new class of iOS app that is bound to change the way we think of, and work with, apps on our devices. I’m reminded of the “life finds a way” line from Jurassic Park: Within the rigid confines of iOS, creative developers are getting apps to perform in ways previously thought impossible. 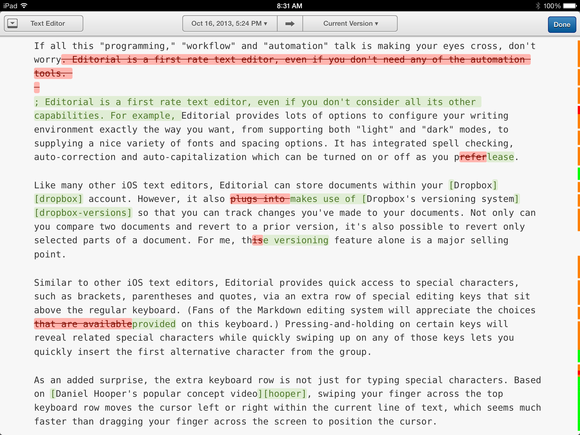 Editorial is still a version 1.0 product, but despite a few minor kinks, it’s surprisingly solid and well thought out. At this time it’s available only for the iPad. Here’s hoping we’ll see iPhone and desktop versions in the near future.